But apparently very little of it gets inside. And at least Mikko always asks for a "wet," which is a damp towel for cleaning up. What are your children's food pleasures? You'll love this week's roundup of pictures on the topic of "Natural Learning" over at Natural Parents Network. See the way children learn at home as part of their days. 38. Know a chair caner? Here we call it flap jacks, and we pour over syrup, sometimes with marmite and cheese as well! That is so funny!!! What a mess he makes! He looks like he enjoys them. That last photo is priceless! I love the bit about the pancakes being mere vehicles for powdered sugar, too :) Pancakes are the best! LOL, he really is the cutest! Love that has to have a whole bowl to dip! When my son was that age, he needed a cookie in each hand. I honestly thought my 18 month old was the messiest eater in the world. I almost used a yogurt covered Aelyn as my WW this week. It looks like she might have some competition! :o) Ketchup is her dip of choice, and we often find that the food is merely the medium for transferring the ketchup to her mouth as well. Happy WW! Ha! A boy who knows what he likes! Our Saturday morning indulgence is waffles, which all of us love. Miles has a crazy sweet tooth as well. He'll have two small chocolate chip cookies for dessert, then ask for ice cream and then beg for a lollipop! My girls love pancakes too, though I've never introduced the joys of powdered sugar, haha! He looks so much like his daddy in this one! So cute! Oh my goodness, you're a braver mama than me. I can barely stand to let my daughter stir the bowl with icing sugar in it because of the mess. 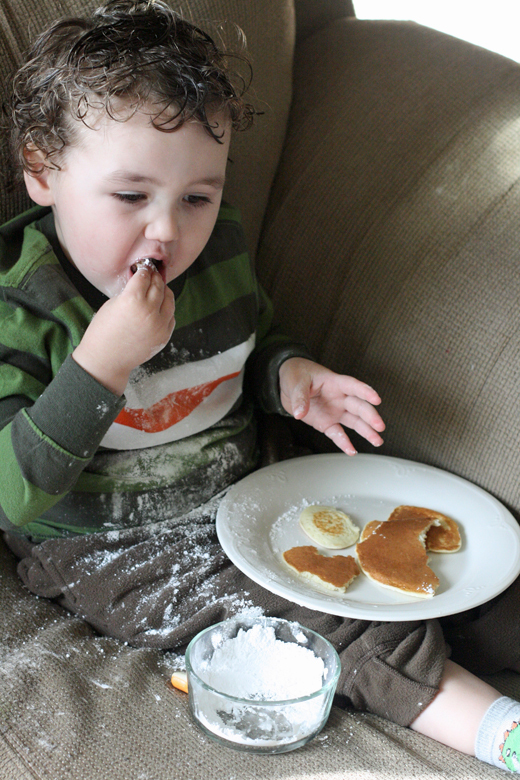 It looks like he has more fun with the powdered sugar than the pancakes.But it is a way to get him to eat. And he is such an adorable little man. #2 likes his syrup on the side. For dipping. And he requires a disproportional amount of it compared to the one pancake he always requests. I've never been a fan of powdered sugar. For some reason I always end up inhaling it when I'm trying to eat it. Does anyone else have this problem, or am I just totally inept at eating?! I'll have to think about Sasha's favorite, but OMG I love powdered sugar! I put a ton of it on my French Toast and when I was a kid I would sneak it to school and eat it straight! My sweet tooth is larger than my head! What cute photos! He is such a cute little guy! Okay, I think I've got it... cookies. Sasha loves regular chocolate chip (or any, really) cookies - much better than the "healthy" cookies made for toddlers. She really does seem to enjoy any food she tries, though, and for that I am thankful! My little guy is obsessed with blueberries. I love that Fat Nutritionist blog! It's awesome! Thanks for the link! LOL, hes a mess! But totally enjoying himself! My hubby makes blueberry pancakes on the weekends, the kids love them! yeah for little kids and their food. That's the way to do it. 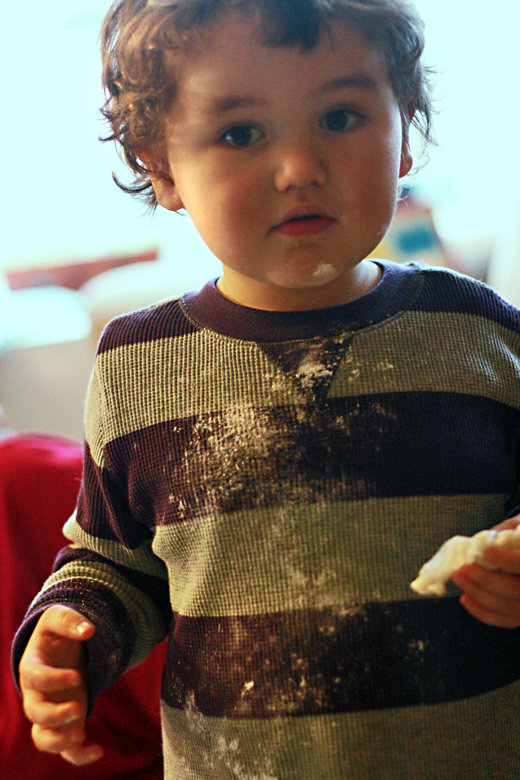 My daughter is obsessed with flour to play with. She keeps trying to taste it, thinking it must taste great since it's the best thing ever. She'll play with it for an hour or until I can't take the mess anymore. That is so funny that your post today was about food pleasures! I posted a pic over at My Inspired Baby of Eden tearing into an Apple. She looooves fruit. I haven't gotten her to pick up on pancakes yet, but she will eat about 3 apples a day. My little one is really into white protein - chicken, fish and eggs are favourites here. Though after seeing that picture of your sweet, sweet boy, I could sure do with some sugar dusted pop corn! @milkymumma It's funny, because I forgot to mention that he'll also eat white chicken meat. I guess he's color-specific in his food choices? @Lisa C I actually was thinking of asking for your recipe when you mentioned before that you serve pumpkin pancakes — but I'm afraid he's already so used to the white kind. The best I could think was to have Sam (Sam's the one who cooks them) mix in some secret ingredients gradually…think Mikko'll fall for it? @Amy @ Anktangle I'm sure it's not just you, but it made me laugh. Reminded me of Airplane! where the main character has a "drinking problem." @Mama Whimsy Oh, my goodness, I could post some ketchup pictures, too! He always needs a huge mound of it. Sounds like he and Aelyn would be great pals. @MomAgain@40 I never thought of cheese — intriguing! Your comment made me irrelevantly think of one time Sam couldn't remember the word for tortilla and he said, "You know — Mexican flapjacks." So that's what we call tortillas now. You can always add a tiny bit of brown sugar or other sugar to the batter if you think he needs it sweeter, or serve it with "white." lol But personally I think the chocolate chips are enticing enough. My son's favorite foods are mandarin oranges and popcorn. I make whole wheat pancakes using this recipe: http://m.bhg.com/recipe/pancakes-waffles/buttermilk-pancakes/ but using the instructions for whole wheat and I think they are just as yummy! My fave variation is to add both chocolate chips and banana chunks. One batch by that recipe lasts us 3 days (we eat them as brunch while my husband is at work). And I bet you could do half wheat & half white if you think Mikko would be opposed to whole wheat!